Cheniere Energy has established itself as the premiere liquefied natural gas exporter in the U.S., but Tellurian aims to rewrite the playbook. Exporting liquefied natural gas from the U.S. is one of the most surprising developments of this past decade. It hasn't been long since this country was considering spending billions on natural gas import facilities, and the export business was nonexistent just a few years ago. Today, the U.S. is a top five LNG producer and will likely take the No. 3 spot this year. Cheniere Energy (NYSEMKT:LNG), which pioneered LNG exports in the U.S., currently can export around 18 million tons per year of LNG, with plans to double that production over the next decade. Cheniere is by far the largest player in the U.S. and the business has performed better than analysts could have expected. For investors looking to get into the LNG business, however, there is another stock worth considering: Tellurian (NASDAQ:TELL). Here's why investors may want to get in on the ground floor on this upstart LNG export business. Tellurian and Cheniere are more closely tied than merely being in the same business. Charif Souki, Tellurian's founder, also happens to be the founder of Cheniere Energy. Souki was ousted as Cheniere's CEO at the end of 2015 because activist investor Carl Icahn thought the company's growth plan was too ambitious -- for what it's worth, it's still following much of Soukis' original plan. One of the aspects that makes Tellurian compelling is that it has a management team in place that's already gone through the entire development process to take a blueprint to a fully operational facility, which included securing contracts, financing, and passing all of the regulatory hurdles along the way. Several of the company's top management team, including Souki as chairman and CEO Meg Gentile, came from Cheniere, and it also picked up several executives from BG Group after its acquisition by Royal Dutch Shell. What's more, Tellurian's management can improve on the process. The technology for the liquefaction process has advanced, so its per ton of production costs is much lower than what Cheniere had at its start. Also, now that Souki and his team have proven the LNG export concept, it will be much easier to find partners in the project to help pay for construction. Cheniere had to rely heavily on debt and some creative financial engineering to find all the funding for its facility, which has left the company with a considerable debt load. Tellurian, on the other hand, is looking to sell to partners a 58% equity portion in the facility, which will help to pay for construction and significantly reduce its reliance on debt. Another aspect where Tellurian is changing the approach Cheniere took is to become a more integrated company. In addition to owning and operating the LNG export facility, it intends to construct several long-haul natural gas pipelines to move gas from several shale basins. It has also acquired some acreage in the Haynesville shale region and wants to produce some of its gas needs to cut down on feedstock costs. This adds some risk and complexity to the business, but if it can use these assets well, it could markedly boost Tellurian's profits. From an operations standpoint, both Cheniere and Tellurian expect to grow considerably over the next several years. What matters to investors, though, is how much value you can get from these stocks. Based on their stock prices, Tellurian looks like it has much more upside potential. One of the attractive aspects of investing in Cheniere is that it has somewhat predictable revenue and cash flow. More than 80% of its production capacity is sold under fixed-fee, take-or-pay contracts. So we can reasonably project Cheniere's future results as new production capacity becomes operational. Based on management's estimates, the company will be able to generate between $7.25 and $8.25 per share in cash flow. At today's stock price, that is a price-to-cash flow range of 7.5 to 8.9. That's actually pretty cheap, but Tellurian's stock looks even more attractive. Its projections for cash flow are a bit more variable because it won't have these same price contract protections. Instead, its estimate range varies considerably based on the future of natural gas prices. If we take the conservative range in its investor presentations, though, investors can expect between $3.66 to $8.55 per share in cash flow. That gives Tellurian a price-to-cash flow range of 1.0 to 2.3. Tellurian is a much more risky stock because its entire business is still on paper and it's awaiting regulatory approval and signing up equity partners. If it can realize its business plan, then its stock looks incredibly cheap even under its most conservative projections. When investing in growth stocks, there is a greater assumption of risk because of the uncertainty. Tellurian's business definitely looks uncertain today, but one thing investors can feel good about is that its management team has a huge stake in its success. Its management and board of directors own 43% of shares. French oil giant Total has a 19% stake in it as well. With that much skin in the game, investors can rest assured that their interests are deeply aligned with those of management. 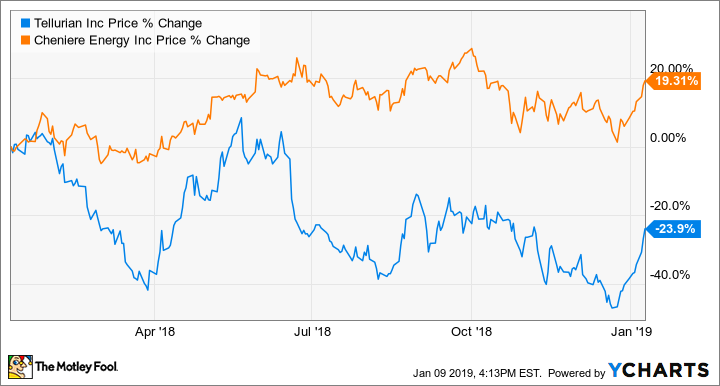 Considering how close Tellurian is to its final investment decision, what the company intends to build, and the current stock price, this stock looks like a great opportunity for growth investors to get into the LNG game, even more so than with industry leader Cheniere. Check out the latest Cheniere Energy earnings call transcript.